Photo 1: GEMÜ Sumondo automation-capable single-use diaphragm valve meets purity requirements of USP and USP . Single-use components and systems now are firmly established in the pharmaceutical and biotechnology industries. The trend toward simplified and flexible upstream and downstream plant design means that these components are becoming increasingly important — especially in biopharmaceutical production. In the past, the only available disposables were primarily tubes, fittings, and possibly filters. But the number of single-use systems has been increasing for a number of years now. It is hardly surprising that plant designers and operators now can rely on a large number of additional single-use components such as bioreactors, sensors, and pumps. Companies can implement a complete upstream process with a single-use design. Automation capabilities have been limited because single-use systems did not have the full range of functions as their counterparts from traditional plant engineering. In 2014 GEMÜ developed and commercialized the first controllable single-use diaphragm valve (see Photo 1). Since that original launch, a diaphragm valve with manual operation capability has been made available in addition to the recently released pneumatic version. Boehringer Ingelheim (Ingelheim, Germany) uses this single-use diaphragm valve in one of its upstream filtration systems. The company’s operators can control that system much more accurately than with a conventional pinch valve, ensuring high functionality of the system and increased ease of use. The advantages of implementing single-use systems are well known: Development and production operations with single-use systems are faster, more cost effective, and more reliable than with traditional stainless steel processing. Single-use systems have lower investment costs and can help manufacturers shorten development and implementation times and reduce qualification and maintenance expenses. Such advantages can result in bringing new biopharmaceuticals and vaccines to market faster. New developments such as single-use systems and platform technologies are making important contributions toward overcoming global challenges in the healthcare sector, particularly in pharmaceutical production. Such issues include not only controlling the rapid spread of infectious and lethal diseases, but also addressing pandemics (a case in which time and funding can affect the number of lives saved). And because pathogens are becoming increasingly resistant to antibiotics, new pharmaceuticals and treatment options continuously need to be developed. Photo 2: GEMÜ Sumondo is manufactured in GEMÜ’s cleanroom in Switzerland, class 8 (in operation). Processes with single-use systems require less time for regular servicing, thus increasing productivity. Furthermore, after completing a batch, operators need significantly less time to replace individual disposables than for cleaning and sanitization processes on traditional stainless steel systems. Disposable systems reduce costs by eliminating the need for chemical cleaning agents, water, steam, and other equipment as well as cleaning validations. Single-use systems typically have a small footprint, so facilities can reduce their costs and total energy consumption. And disposable systems are safer because of their reduced risk of cross contamination. Contract manufacturing organizations (CMOs) also benefit from using single-use systems. Disposable systems allow CMOs the flexibility to produce small quantities of products or to produce them within a short period of time with its customers’ specifications. Single-use systems are now indispensable in small- and medium-volume biopharmaceutical processes in all main process steps, but especially in upstream processing. But in spite of this, there are still no industry standards specific to single-use systems. However, there are now a few technical guidelines that can be referred to, including ASTM Standard F838-05 (relating to sterile filtrations) and ANSI/AAMI/ISO Standard 11137 (on the sterilization of healthcare products). Those and other industrial standards, statutory regulations, and regulatory guidelines can be applied to single-use systems and are described in the Component Quality Reference Matrix of the BioProcess Systems Alliance (BPSA). The BPSA’s objectives are to promote the development and manufacture of biopharmaceuticals around the world through the implementation of more robust, more reliable, and more sustainable single-use technology. The group was founded in 2005 as an industry-led corporate member trade association dedicated to encouraging and accelerating the use of single-use production plants for the manufacture of biopharmaceuticals and vaccines. The organization promotes education and knowledge sharing and contributes to the development of consensus-based guidelines and increased networking among business members. At present, the BPSA has 55 members who are manufacturers or users of single-use systems. The BPSA currently coordinates activities of interest to manufacturers and users of single-use systems. These include tracing particles, regulating processes and the integrity tests of single-use systems. The BPSA also discusses change notifications and the requirements of single-use implementation. In addition, it is involved in activities relating to the sustainability of single-use systems and the training of technicians for those systems. Work groups within the BPSA work on those topics. With a team consisting of members from research and development, product management, and a US subsidiary, GEMÜ contributed to the test matrix for testing single-use components with a focus on single-use valves. 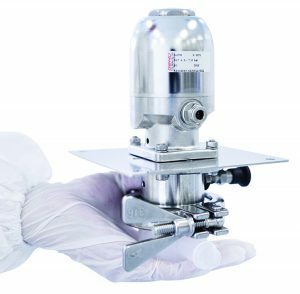 GEMÜ manufactures valves and measurement and control systems for aseptic and sterile applications in the pharmaceutical and biotechnology industry. As a system supplier, the company can deal with customized, project-based customer requirements. The purity and quality of medicines have improved dramatically over the past few decades. In addition to complying with strict regulations and approval conditions, GEMÜ has contributed to biopharmaceutical development, especially with diaphragm valves. A number of regulatory codes and current good manufacturing practices (CGMPs) call for equipment that is easy to clean to prevent cross contamination. Such requirements have led to the use of valves that are easy to clean, sterilizable, autoclavable, and self-draining and have minimal deadleg. 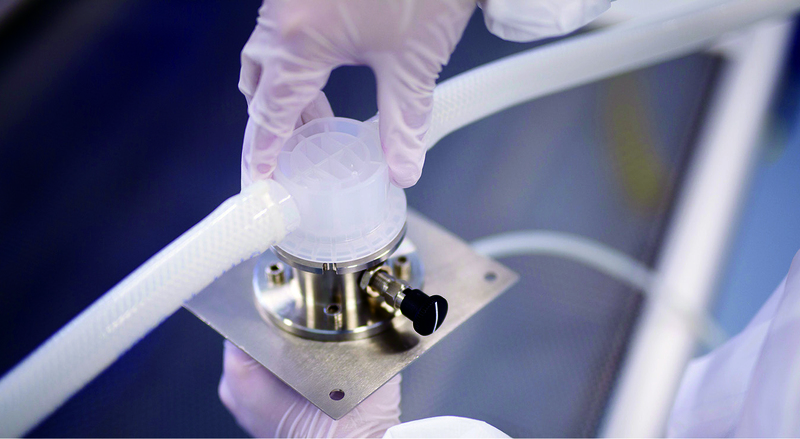 Consequently, FDA-compliant diaphragm valves have established themselves in sterile applications and have become the standard in the biopharmaceutical industry. Areas of application range from the production of eye ointments to insulin and monoclonal antibodies (MAbs). Aseptic stainless steel valves also are used in applications relating to fine chemicals, for example. Depending on the version selected, such valves also can be suitable for water for injection (WFI), ultrahigh-purity chemicals, and intermediate and final biopharmaceutical products. Photo 3: During assembly the single-use diaphragm valve body is fixed to the pneumatic stainless steel actuator and locked by means of an indexing plunger. The pneumatic stainless steel actuator remains as a stable component for multiple body use. Functional Principles and Advantages of Diaphragm Valves: Excellent performance of a diaphragm valve in an application requires the interaction of tuned components, including the valve body, shut-off diaphragm, diaphragm fixing inside the compressor, and the actuator. As a central sealing element in the piping system, the diaphragm is of major importance. The diaphragm and the valve body are the only components that contact a medium. At the same time, the diaphragm also guarantees external hermetic sealing of the piping. During the closing process, it deforms under a compressor and is pressed onto the sealing weir of the valve body with a positive and nonpositive fit. This controls the media flow in the piping or interrupts it when the valve closes completely. Depending on the medium and temperature, suitable diaphragm materials are available for every area of use. We can make a basic distinction between elastomers and fluoroplastics. Elastomers include nitrile rubber (NBR), fluoroelastomer polymer rubber (FPM), silicone, and ethlylene propylene diene monomer (EPDM). Fluoroplastics can be made of polytetrafluoroethylene (PTFE) or TFMTM material (proprietary of Dyneon), for example. The compressor is actuated by means of a spindle, which in turn is moved by the actuator. The compressor is used to transmit the closing and sealing force and reform of the shut-off diaphragm. When the valve is being opened, the diaphragm fixing inside the compressor plays an important role. The most widespread fixing is one that uses a threaded pin (providing a high level of safety) such as when used under vacuum-operating conditions. The diaphragm valve can be operated either by a handwheel or by a pneumatic or motorized actuator. Pneumatic actuators that are activated using compressed air or inert gas are most commonly used. Manually operated diaphragm valves also can be used in pharmaceutical operations for both autoclavable plastic (e.g., under higher operating temperatures) and easy-to-clean stainless steel handwheels. Pneumatic actuators have various control functions, and the actuator inside is designed differently for each. With the “normally closed” control function, the spring set is located in the upper section of the actuator and keeps the valve permanently closed without any energy expenditure. If the valve is actuated, compressed air enters the lower section of the actuator, which squeezes the spring set together in the upper part of the actuator and opens the valve. This is the most common type of actuation. In the event of a power failure or a compressed-air supply failure, the valve automatically moves into the closed position, whereby the medium cannot run off unhindered. In other applications, however, that fail-safe function may work such that the valve is designed to open in an emergency. In this case, the spring set is located in the lower section of the actuator (under the control piston or the actuator membrane), which is why the valve always remains open in the “off” position. This control function is referred to as “normally open.” Pneumatic actuators also can have a double-acting configuration. For this purpose, a spring set is not installed in the actuator, and compressed air controls the opening and closing of the valve. In the event of a compressed-air supply failure, the valve enters an uncontrolled position, which can be manually overridden with the addition of an emergency manual control. An optical position indicator shows users whether the valve is open or closed. It can be a mechanical indicator (which states the linear movement of the actuator spindle) or an electrical position indicator. Valve bodies are available in a number of different designs. Typical designs include 2/2-way bodies, T valves (e.g., for media distribution and for use as a sampling valve), and tank-bottom valves. Different materials and connection types are available. Diaphragm valves are generally suitable for high-cycle duties. If they are equipped with optionally available automation components, diaphragm valves also can perform control tasks. In addition to standard components, GEMÜ also offers a large number of customized solutions such as multiport valve blocks, in which several diaphragm valves can be grouped together in one compact unit with optimized draining, as well as tank valves and valves for sterile sampling. Individual components of diaphragm valves can be precisely synchronized with each other and further optimized. Optimizations are important for maintenance intervals, process reliability, and product quality. The optimum configuration of the spring set and the operating pressure, for example, is crucial for determining the service life of a diaphragm. The precise interlocking of the diaphragm and body contour is an important factor not just for tightness, but also for good cleanability. GEMÜ valve bodies have a raised circular sealing bead on the inside diameter, which not the case for valve bodies from other manufacturers. The raised sealing results in a defined sealing edge. This European Hygienic Engineering and Design Group (EHEDG)–certified seal system reduces the ring-shaped gap between the diaphragm and the valve body in the external sealing, making GEMÜ diaphragm valves suitable for sterile applications. GEMÜ developed this crucial design and functional feature over three decades ago and is continually refining it. In the development of the single-use diaphragm valve, GEMÜ’s aim was largely to use existing components and apply tried-and-tested designs to a single-use concept. However, this process involved addressing a number of questions: How can the existing actuator designs be integrated into a single-use system? How is it possible to fasten a diaphragm in a single-use valve body so that just one component represents the actual single-use component? What materials are suitable for the body and diaphragm? How can a connection be made between the actuator and the seal so that the valve body and the actuator can be detached from one another quickly and without tools? Boehringer Ingelheim was one of the first companies to implement the technology into its pharmaceutical processes. This was a major advantage for GEMÜ’s new development (a single-use diaphragm valve with handwheel) because collaboration during early development stages meant that a practical solution could be found quickly. This arrangement was also able to tie the new development in with the pneumatic versions of the company’s Sumondo single-use diaphragm valve, which had recently been introduced. As a CMO in biopharmaceutical development and production, Boehringer Ingelheim knew what the valve would face during daily use. An intensive exchange resulted in a valve system with significantly improved functionality and controllability compared with conventional pinch valves. Pinch valves were used in upstream filter units and were susceptible to certain common problems such as cracking and adhesion, which directly affects process reliability. Biopharmaceutical manufacturing involves demanding procedures. Synthetic drug products are produced using chemicals and are developed for the largest group of patients possible. By contrast, biopharmaceuticals are based on large, highly complex protein molecules that have very specific effects on a body’s normal processes. They are intended to provide customized therapy, cause as few side effects as possible, and be administered in small doses. Examples of biopharmaceuticals include antibody fragments, hormones such as insulin, enzymes for treating thrombosis, and drug products for rheumatic diseases, multiple sclerosis, and anemia. It is not just the fact that they are made from cells growing in cultures that makes them extraordinary, rather it is the genetic modification of the cultures that produce the required active substances and the genetic production that make the process particularly special. The entire upstream and downstream areas are highly sensitive processes that must comply with stringent requirements for development and production. Focus on Filtration: Before a downstream process, mammalian cells must be separated from culture medium using several filtrations steps with the cell suspension. To prevent cleaning and cleaning validation problems, single-use filters can be used with enclosed ready-to-use diaphragm filters. The main benefits of using such filters include a significantly reduced risk of exposure for operators, lower cleaning costs, higher yield, and improved handling. The filters can be integrated in stainless steel frames and mounted on wheels. With a specially developed housing, only the inlet, outlet, and ejector between the modules come into contact with the product to be filtered. 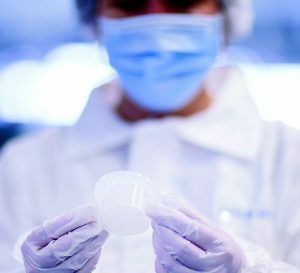 To filter the cell suspension, Boehringer Ingelheim technicians connect filter capsules in series, and cell clarification takes place in several stages. Coarse filtration is carried out first, in which particles and turbid materials are removed. This depth filtration takes place at 2-bar pressure, which is why pressure-strengthened tubes are used. Cross-flow filtration (with cartridges, hollow fibers, and ceramics) was commonly used for this process. For purifying complex cell suspensions, however, depth filtration offers a number of benefits. Cells that produce active substances (bacterial cells in particular) also continue to be subject to cross-flow filtration. Filtration properties of depth filters depend on whether kieselguhr (diatomaceous earth) is used, which is predominantly used for finer layers. Flushing with pure water during the process ensures maximum purity. Because of the wide distribution of particle sizes in a cell suspension, depth filtration uses dual-layer capsules, which can be distinguished from others by the combination of two different filter layers. This can lead to significantly higher filtration performance, and it means that preclarification (e.g., through centrifugation) can be eliminated. Downstream fine filtration takes place under low-particle conditions. At the last filtration stage, filter diaphragms have a pore size of 0.1 µm and are gamma sterilized. The filtered suspension is then transported to a harvest hold bag. A number of filter units are connected to each other by manually operated GEMÜ single-use diaphragm valves. Between them are units used to flush filter capsules (during depth filtration) and storage tanks for filtered medium or medium to be filtered. Diaphragm valves take on various functions in that process: They are used for flushing, to vent filter capsules, and to convey medium from a storage tank to the next filter capsule. The first controllable single-use diaphragm valve (the Sumondo unit), is a milestone in single-use technology: from manual systems to automation-capable and controllable plants for safe operation and continual documentation by the plant monitoring system. Development of this technology involved applying expertise in diaphragm valve engineering to single-use technology. Thanks to innovative membrane joining technology, manual and pneumatic actuator units in conventional plant engineering also can be used in single-use processes. As with encapsulated thermoplastic elastomers (TPE) diaphragms, the valve body made from natural polypropylene comes with extensive regulatory approvals, such as those required in the biopharmaceutical industry. The Sumondo system links the valve body and actuator together using a patent-pending locking mechanism. The single-use diaphragm valve body is fastened to the operator using a clamp. The valve body and the manual operator are joined together using a defined closing and opening procedure. After use (such as at the end of a process), only the valve body is removed and disposed. The actuator itself can be reused repeatedly. The polypropylene valve body is produced in a cleanroom of ISO Class 8 (in operation) and double packaged. It is gamma-sterilizable up to 50 kGy. The ultrasonically welded TPE diaphragm hermetically separates the working medium from the environment and from the actuator. The medium remains closed off from the environment by the internal welded diaphragm not only during operation, but also after removing the valve body. The major advantage of this technology (compared with conventional pinch valves) lies in the exact controllability of processes. With a tried-and-tested actuator design from conventional plant engineering, the actuator can transmit feedback to a plant-monitoring system as needed to ensure complete monitoring of a controlled system. This modular concept makes single-use systems, standard stainless steel valves, and feedback units compatible with one another. The ability to send feedback to a plant-control system facilitates documentation, reproduction, and validation of pharmaceutical processes. Increased automation also makes process systems less susceptible to faults. With a single-use diaphragm valve, users can manufacture their products simply and safely. For Boehringer Ingelheim, using single-use diaphragm valves has numerous advantages. Neither valve function nor handling depend on hose diameter and material because the ergonomically designed handwheel reduces effort required during actuation. As a result, volumetric flows can be controlled precisely. So for example, introducing additives to meet requirements can be set accurately. Such improvements make significant contributions to process and product reliability. Another benefit is the elimination of servicing work. In stainless steel biopharmaceutical plants, operators often need more than one and a half to two weeks to change diaphragms. When faced with the question of whether to implement single-use components in plants or plant sections, it is necessary to consider a number of different aspects. Important factors in this decision are the number of planned product runs, the range of products, and the cost of documentation and cleaning validation. The decision in favor of using single-use technology often is made for new products if product quantity is low or short campaigns are to be run with a large number of different products. Since 1994, Boehringer Ingelheim also has been active in China and has since then built up a wide range of activities in research, development, manufacturing, and marketing. There, a similar plant for manufacturing and purifying biopharmaceuticals was put into operation in 2015. An expansion of production capacity is currently in the implementation phase. Investments in this area are expected to meet customer requirements and become an important part of China’s biopharmaceutical manufacturing industry. Mareike Monninger is applications specialist at GEMÜ. Valentin Rüttimann is a product manager for GEMÜ SUMONDO at GEMÜ Gebr. Müller Apparatebau GmbH & Co. KG, Fritz-Müller-Straße 6 -8, 74653 Ingelfingen, Germany; www.gemu-group.com.